Last week during my errands, I took a trip to my favorite local apple farm to pick up some apples. I had full intentions of going anyway, but it was especially necessary after seeing what apples my local grocery store had available… pitiful. When I go to the farm, I like to stock up. I don’t get a tiny bag, I usually get a half bushel which is easily 20-25lb of apples. They were having a Thanksgiving deal that was too good to resist. So… I left with a full bushel of apples. I’ve never had this many apples in the house at once. It’s kind of nuts. I see pie, crisp and applesauce in my very near future. That is of course, if the kids don’t eat them all first! Also, we went on a gingerbread house hunt. I’m all for making my own, but it’s time consuming. Maybe another year. But for now, a boxed kit works for us. Unfortunately most aren’t peanut free, so finding a safe one can be hard. Last year I found the Tootsie gingerbread house kit which just so happens to be peanut free – big win there! I’ve only seen it in a few stores so far this year, but if you’re looking, just know it’s out there! Julie convinced me to watch The Royals. The first season is free through Amazon Prime and I’d been looking for a fun new show to try. It was a quick show to not only get sucked into but to fly through. A short ten episodes for the first season. The good thing is the second is currently airing! If you like drama or English shows… though to be fair, this isn’t your typical English show. It’s a modern day English drama with mystery and romance all intertwined. Fun all around. I’m now in prep mode, trying to nail down my schedule for what’s going on this week… appointments, days off from school (we’ll get back to that), recipe testing and of course pie making for Thanksgiving! So much to do in such a short time. My obsession with lists is going to come in very hand this week. Also, seriously someone explain to me why on earth kids these days have the day before a holiday completely off? Growing up we always had a half day, which to me still seems totally reasonable. It’s enough time to still get any traveling in and then you’re not wasting a whole day in the school calendar. Is it just our school district or are all doing this now? Clearly I’m a HUGE fan of reinventing Thanksgiving leftovers. Because the same thing can get boring real fast. Remember… if you want even more ridiculously tasty leftover ideas to check out the archives! 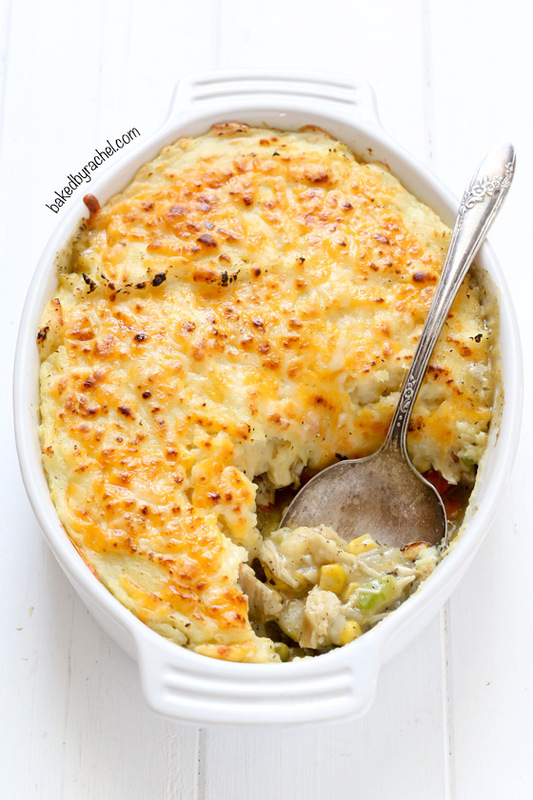 Going for something new and fun, I decided to put a spin on a classic shepherd’s pie, using Thanksgiving leftovers! Of course, if you don’t have leftovers, feel free to start from scratch. It’ll be completely worth it! 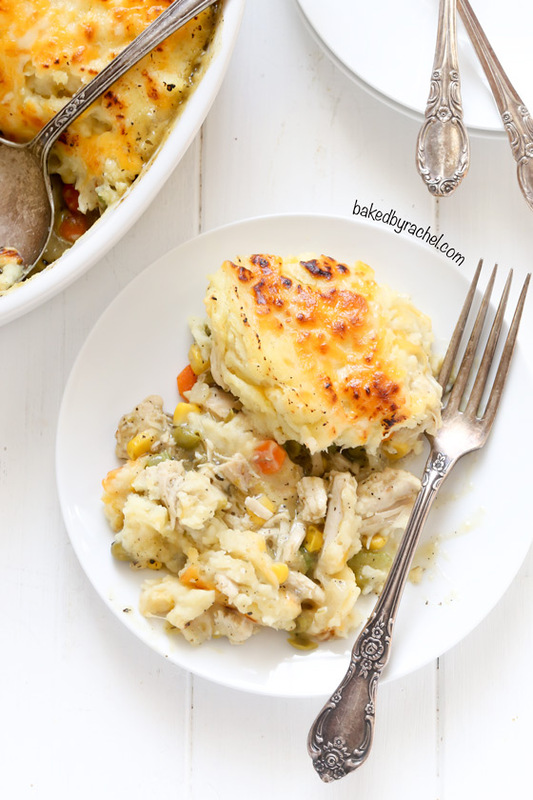 This super flavorful leftover Thanksgiving turkey shepherd’s pie is an absolute must make! Even the kids were asking for more! 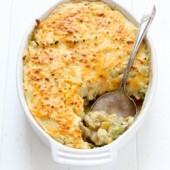 Moist leftover turkey combined with vegetables and gravy are topped off with creamy mashed potatoes and cheese! A fantastic dinner for the entire family…and everyone will be asking for seconds! 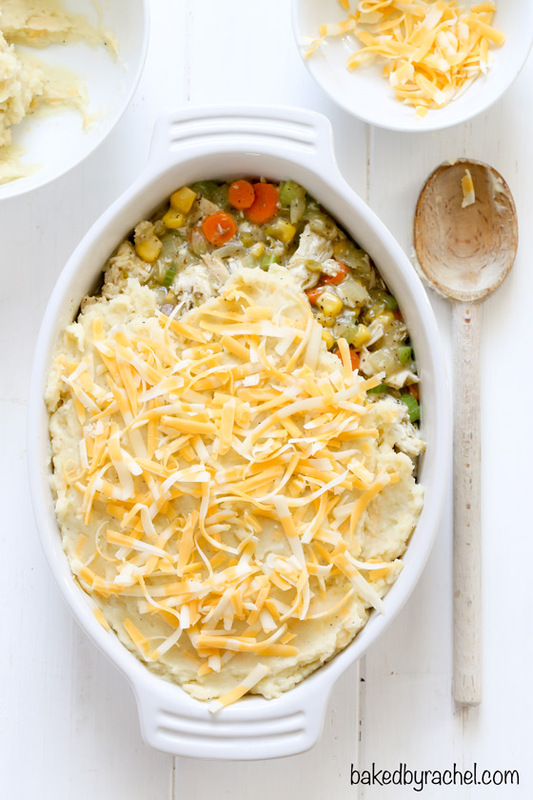 Be sure to add this turkey shepherd’s pie to your dinner plans! Moist turkey, combined with vegetables and topped off with creamy mashed potatoes. 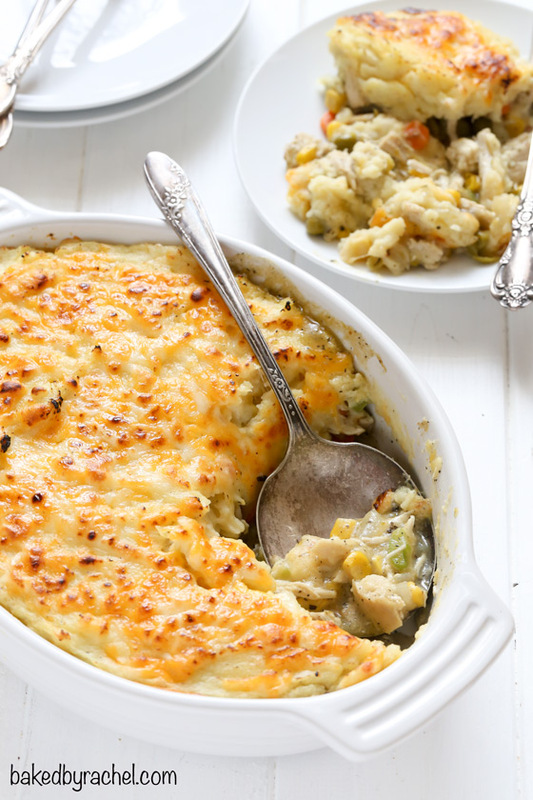 Thanksgiving leftovers reinvented into a flavorful shepherd's pie. In a large skillet over medium heat, melt butter. Add onion, celery and carrots, cooking until onions are translucent. Add minced garlic, cooking for an additional minute. Add turkey, corn and peas (or green beans), along with seasonings and gravy, cooking until heated through. Transfer to a 1 quart baking dish, pressing into an even layer. Heat mashed potatoes until luke warm and easy to stir. Add half of the shredded cheese to the potatoes, stir to combine. Spread mashed potatoes over the turkey filling. Sprinkle with remaining cheese. Bake for 30 minutes. If desired, broil or use a kitchen torch to char cheese slightly. *Roughly 3/4lb potatoes should be used for mashed potatoes, if no leftovers are available. Cook, mash and season as desired, then continue with recipe.